Before San Francisco rose as one of the most successful, thriving, and popular cities in the United States of America, it was explored by early Europeans. In September 28, 1542 Juan Rodriguez Cabrillo form Spain explored the coast of California and the Bay Area. The city of San Francisco has been thought of as having three distinct stages for its formation since the late 1700’s. The first stage is thought of as the presidio stage. The San Francisco Bay was first recorded and mapped by Spanish navigators in 1775. In September of 1775 under the command of Juan Bautista de Anza and Jose Joaquin Morga and accompanied by soldiers, settlers, and two well-known Spanish priests they arrived to the bay in July of 1776. Before the settlers, soldiers, and priests arrived to the Bay, the acclaimed Spanish navigator, Captain Juan Manuel de Ayala was ordered by the Spanish to explore the area. Ayala was required to include a map of the surroundings in order to supply the soldiers with a successful presidio and the settlers with a successful settlement. They also hoped to establish a Catholic mission in the Bay Area. Captain Ayala’s pilot, Jose de Cañizares, is credited for exploring the Bay Area and establishing a written map of the locations surrounding it. In his map, famously known as the Cañizares map, he referred to the Bay as not just one body of water surrounding the land, but many bodies of water. In 1776 Cañizares further explored the Bay Area and named the new bay La Bahia de San Francisco. This is significant because it is the recordings of the land being surveyed and named. Years later, The Spanish reached one of their primary goals and established a prominent mission still standing today in San Francisco, called Mission Dolores, but with the official name of San Francisco de Asis. The Mission is referred to as the second stage in the establishment of San Francisco. The Spanish did not further expand and settle the area; their main purpose of exploration was to establish a presidio and mission. The Mission Dolores is significant because it helped bring settlers into the area and helped attract others in the future. Mission Dolores is part of the twenty-one Mission system established by the Spanish along coast of California. 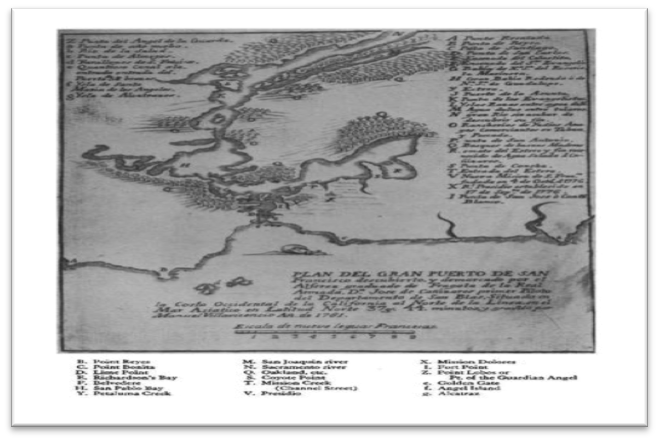 The Cañizares Map, helped many after the Spanish know the geography surrounding La Bahia de San Francisco. During the 18th century the Bay Area was established as spaninsh territory. In 1786 a French navigator named Jean Franoise Galaup Comte de la Pérouse was appointed by the French government to take a geographical and commercial based expedition to La Bahia de San Francisco. Jean Franςoise navigated the Bay Area based on the Cañizares map. de la Pérouse expored the Bay for ten days where he produced a hydrographic chart to be sent and published in France along with all of his other findings. Unfortunately, Jean Franςoise Galaup, Comte de la Pérouse did not return to France and his ship was found wrecked on an island near New Hebrides. The French and Spanish were not the only Europeans to be interested in exploring the Bay Area. English explorers also had their part in encountering the Bay and recording its geographical areas. Captain George Vancouver of England arrived to the Bay in 1792, although his visit was short, he recorded the geographical area and paved the way for other foreigners to explore the Bay Area because during this time the Bay was known as Spanish territory. In 1803 Captain James Rowan from the United States entered the Bay this was the first American ship to go to the bay known as The Eliza. In 1821 the Bay area along with the rest of California belonged to Mexico because in early 1821 México became independent of Spain and California became Mexican property. As a result, the Mexican Government granted many other foreigners permission to survey the land. The last stage of the foundation of San Francisco is known as the Pueblo of Yerba Buena. In June 25, 1835 Captain William A. Richardson was granted permission from the Mexican government to first settle in the Bay Area. Richardson is credited for successfully implementing the first “town” with a couple of residents. Richardson’s town was not formerly known as a town by the Mexican government because it lacked the four thousand resident requirements by the Mexican government to be a self-governing seaport. However, it later became the town Yerba Buena. Richardson was born in London and navigated the seas, but after encountering the Bay he decided to stay and settle there. During Richardson’s early years of settlement he had what was describes as a tent, but then built his house out of adobe, this historical house was called The Casa Grande. Richardson was not alone in Yerba Buena many other successful merchants also moved to Yerba Buena. Jacob Reese was a merchant living in Yerba Buena who established partnership and commerce with others. Reese’s contributions as a merchant and business man lead many merchants to the Bay. Richardson’s actions to settle in Yerba Buena was successful in the long run because it brought attention to foreigners and in less than fifteen years gold was discovered in the area. As a result of exploration of the west and the Oregon Trail from 1843 to 1845 more Americans settled in Yerba Buena and there was a population of about 150 residents. By 1846 Yerba Buena was a successful town with a working port trading system. Yerba Buena’s first American Mayor Washington A. Bartlett appointed by Captain John B. Montgomery changed the town’s name to San Francisco in 1846. Also in the same year, John Charles Fremont, a prominent American military officer named the entrance to the Bay the Golden Gate. After the town Yerba Buena changed its name to San Francisco, the town underwent rapid economic, political and population changes. A rapid political change was the establishment of a legal government. In 1846 General Stephen Watts Kearney commander of the Army of the West settled in San Francisco and appointed the city generals their new roles and managed to set a government with new laws that reflected the laws set by the Mexican Government to honor the fact that California was still officially part of Mexico. A couple of years later from 1846-1848 California was undergoing a significant transition and became part of the United States of American. After signing the Treaty of Guadalupe Hidalgo in 1848 the transition was official although many American officers and appointees had already settled in Yerba Buena in the Hopes to start a new city. By 1848 the town of Yerba Buena was immediately converted from the Mexican to the American government. On February 2, 1848 the Treaty of Guadalupe Hidalgo gave full control of the San Francisco port and land to American Government and American officials in the area. By 1850 the first City Charter of San Francisco was established six years later in 1856 the State made San Francisco a county and is known as one of the first 27 counties in California. San Francisco’s population grew immensely throughout the years known as the California Gold Rush. From 1847, when the first nugget was discovered in northern California in 1849 the population of San Francisco more than doubled. The population in 1848 was around 850 to 1,000 residents and there were about 50 buildings, so by the time of the Gold Rush San Francisco was ready to grow commercially. The California Gold Rush is the United States is the biggest migration in the United States. Records of the first discovery of gold in San Francisco go back to the construction of a sawmill supervised by James W. Marshall, but he kept silent about the findings to others outside of San Francisco. Soon after the first discoveries of gold others also found gold in the areas surrounding San Francisco and the news broke out. People from the United States were not the only ones traveling to San Francisco to witness the findings and take back gold, but also people from other countries were migrating to San Francisco to mine for gold. The discovery of gold produced a huge economic impact for San Francisco. The economic impact was mostly the cause of gold seekers demanding somewhere to live for their time in the mining town. Also many merchants saw business opportunities because of the port and less competition as oppose to New England, where competition was found in abundance. The discovery of gold almost immediately caused urbanization and a high demand for infrastructure was observed. There was also a high demand for transportation infrastructure that started in the beginning of the Gold Rush years. Two of the major mine distributing points in 1849 were the Stockton and Sacramento areas, which were located by bodies of water, notably the San Joaquin and Sacramento Rivers. Thus, the San Francisco Bay Area facilitated the distribution of mining material by being the leading transfer point. By 1849 the population of San Francisco more than tripled, however more than half of the population was foreigners. Predominantly Central, South American, and Chinese were migrating to San Francisco to witness the gold discoveries and take some gold back to their native land. By 1849 San Francisco’s population was recorded to be 6,000 and mostly comprising of non-California residents and non-American residents. During the Gold Rush the term 49ners was given to the many men who left and sold most of their belongings including: property, and also borrowed money just to travel to the San Francisco area and mine for gold in order to gain some type of wealth. The 49ner migration was significant because there was a demand for the city to grow and accommodate all of the gold seekers. Because it was predominantly males who settled the area, there was a shift in the type of community gatherings being built. There were many Gold Mining Towns around the San Francisco area and they changed the way the communities were set up. The different gold mining communities had lucrative Saloons, barbershops, and mining tool shops. During the years of the Gold Rush San Francisco’s economy was grand, this change for San Francisco marked the change into a metropolis era. 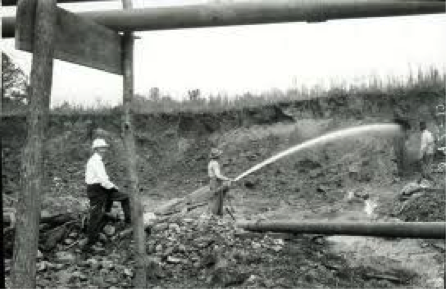 Gold mining was at first very common and brought some a lot of wealth, but the mining scene was slowly decaying because the job was dangerous, tough, and was not producing as much gold as before. By 1853 gold mining shifted significantly and was no longer made up of independent workers, but into wage labor workers in what was called hydraulic mining. Most of the planning in the early years of San Francisco was not as organized and clear as it is now rather it was more of a natural event. Jasper O’Farrell made the first comprehensive Survey of San Francisco. O’Farrell was hired in 1847 and is crediting for extending San Francisco’s boundaries. O’Farrell is well-known for designing what is known today as San Francisco’s Market Street. Other streets parallel to Mission Road we all established by O’Farrell. The early San Francisco planning was done on the microscopic level rather than as a whole and there were not very much land regulations by the government. Planning was done individually and privately. For example, the planning efforts of San Francisco’s South Park were established by the promoter, which planned much of the efforts to keep South Park substance free by prohibiting liquor Saloons and required the buildings in the area to be made out of bricks to have this urban design consistency. Although much of the early planning was done on the individual private level, the San Francisco Council Members did set apart street plats and plaza centers for the purpose of future civic gatherings. Most significant in early planning is The Van Ness Ordinance in San Francisco. The ordinance was established to break free from the individual private planning process and have a more collective plan. The Van Ness Ordinance was written by the Mayor of San Francisco in 1856 and it was meant to break up the land to the west of San Francisco. The Van Ness Ordinance is recognized for initiating other master plan type documents in San Francisco because after the Ordinance the council began to think of other ways to regulate all types of areas in the city. The Van Ness Ordinance did a few notable things in San Francisco. The first thing was that it set apart other land parcels for commercial uses. The second thing the Van Ness Ordinance did was it set the land in the west apart for educational purposes like building of schools. As the city of San Francisco began to see the population increase and the city began to be more complex there were huge demands for continuous regulation of land in certain areas. Zoning was seen in the early 1850’s because the public did not want certain types of commercial uses in specific neighborhoods. For example, slaughterhouses, acid factories, and stockyards were stopped from being built in areas with a large population because of odor and waste problems at the time. By 1854 the banning of certain unwanted commercial spaces was completely prohibited in San Francisco. 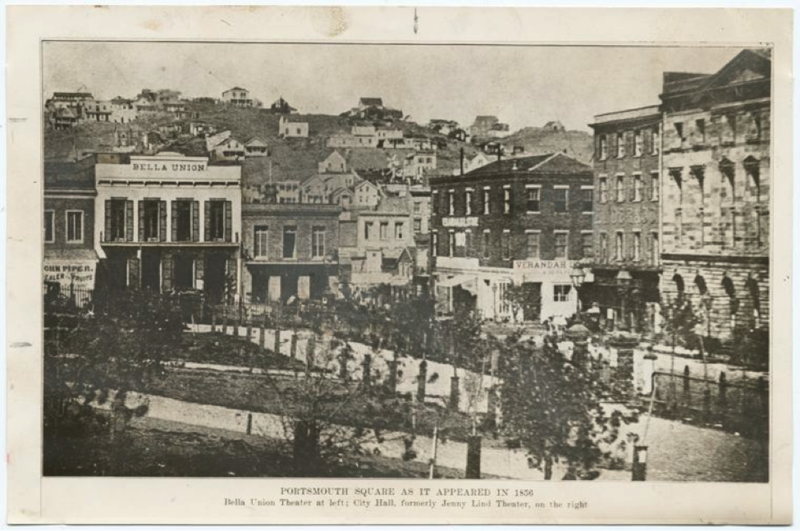 After the zoning of individual land parcels and banning of certain unwanted factories, early zoning in San Francisco was a natural event that caused the segregation of many areas. Some areas were designated as manufacturing only, while other areas were strictly residential, but they were also segregated into different communities. Another form of zoning that made a significant contribution to the dynamics that shaped the different communities in the early years is the notion of classes. The middle class settled in areas that were relatively new, thus the wholesaling retail community also moved to the neighborhoods were middle to upper class was found. The section of early San Francisco where there were more middle and upper class were over the hill to the west specifically the Rincon Hill area and south of Market Street. Since San Francisco’s early years of settlement, many of the settlers preferred buildings on low grounds because it was convenient. Some of the earliest avenues were Palou, Peralta, Richardson, Van Ness, and Pico Avenues. Also some early streets include Post, Russ, Ringgold, and Powell streets. Being close to waterways made everything much more easy to export or import commerce and other things that contribute to a cities success. 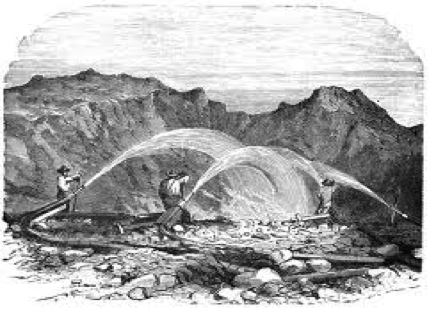 The Gold Rush added more low ground infrastructure and communities. However, during the last years of Gold Rush there was an immediate frenzy to inhabit San Francisco low-density areas and the increase in population was more inland and further away from waterways. This created a plan for more streets and a demand for higher density in a given area. The Hayes valley, Horner’s Addition, and Potrero Nuevo were all new areas that were settled as a result of the increase in population. Soon after the impact of the population Rincon, Telegraph, and Nob Hills were created by leveling the land and the area was ready for the construction of new communities. McGloin, B. John. San Francisco: The Story of a City (London: Presidio Press, 1978), 12. Sally B. Woodbridge and David Rumsey, San Francisco in Maps & Views (New York, New York: Rizzoli International Publications Inc., 2006), 18. McGloin, B. John. San Francisco: The Story of a City (London: Presidio Press, 1978), 24. McGloin, B. John. San Francisco: The Story of a City (London: Presidio Press, 1978), 25. Sally B. Woodbridge and David Rumsey, San Francisco in Maps & Views (New York, New York: Rizzoli International Publications Inc., 2006), 24. William, Issel and Robert W. Cherney. San Francisco, 1865-1932 Politics Power and Urban Development (Berkeley: University of California Press, 1986), 13. Lotchin W. Roger. San Francisco 1846-1856 From Hamlet to City (New York: Oxford University Press, 1974), 6. “The Gold Rush of 1849” A&E Television Networks, LLC., History. 3-4-2013. http://www.history.com/topics/gold-rush-of-1849. “San Francisco Street Names for Pioneers” Virtual museum of the City of San Francisco. 3-4-2013. http://www.sfmuseum.org/street/stnames5.html. Lotchin W. Roger. San Francisco 1846-1856 From Hamlet to City (New York: Oxford University Press, 1974),10. Lotchin W. Roger. San Francisco 1846-1856 From Hamlet to City (New York: Oxford University Press, 1974), 15.